If this page took more than four seconds to load, there’s a good chance you wouldn’t be reading it right now. Research suggests one in four people will abandon a website that takes more than four seconds to load. We know consumers are an impatient bunch, but when you’re in the business of selling products, or engaging with your audience online, a four second delay could impact your bottom line. Amazon processes approximately $67 million in online sales every day, but a one second delay in page load time puts the company at risk of losing $1.6 billion in sales a year. It’s a remarkably short time frame for such a significant loss, and the digital marketing experts at Alyka believe Australian businesses are particularly at risk. Why? Because Australia’s internet speed already ranks behind 50 other nations including Thailand, Estonia, Bulgaria and Kenya. And with such fierce global competition online, every second counts. Thankfully, there is a solution to help you reclaim those four seconds. It’s called Accelerated Mobile Pages (AMP). AMP is an open-source project by Google and Twitter to improve the speed at which websites load on mobile devices. The concept is similar to Facebook’s Instant Articles, where a version of the web content is pre-loaded and pre-rendered on a temporary Google cache. The cached information can then be recovered instantly in the form of a pop-up article instead of a full HTML webpage. The project is setting a new benchmark for mobile web page accessibility, improving user experience by making it faster for people to access content. And it’s not just saving time – AMP pages use 10 times less data than equivalent non-AMP pages, meaning you use less data to view them. AMP has been popular with customer-centric businesses such as news and retail outlets across the globe. For example, the Washington Post AMP’d its content and reported an 88 per cent improvement in the load time of AMP content compared to traditional web content. Leading French organic retailer, Greenweez, also AMP’d its content leading to an 80 per cent increase in mobile conversion rates for sales. These promising results are also prompting more e-commerce businesses and social media platforms to adopt AMP to help attract more viewers by sharing content at rapid speed. 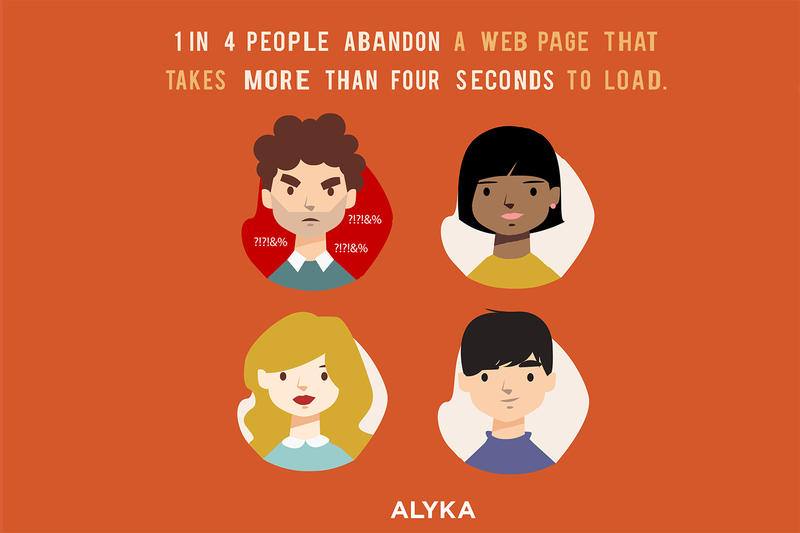 If your mobile web content fails the four-second test, you can contact Alyka on 08 9200 4429 to AMP up your content!